Spring has Sprung, at least here in Northern California, mid 70’s all week. Blossoms in bloom and pretty much the time for spring cleaning, fresh air and of course the annual yard and garage clean up. Thank goodness for the longer days, we might even get some golf in. The first day of spring in North America is March 20th. Spring is the time of the year for renewal. March is also National Nutrition Month. This is an annual nutrition education and information campaign created by the Academy of Nutrition and Dietetics. The campaign, celebrated each year during the month of March, focuses on the importance of making informed food choices and developing sound eating and physical activity habits. One of the main principles and advantages of a Nikken Wellness Home is that it makes healthy choices easy on a day to day basis, so we can all Be Healthy by Choice. Making healthy food choices is a challenge for many of us. Think about it, one of the most important decisions we make every day is what we eat and drink. It is everyone’s Choice to eat Healthy or not. We have previously discussed the importance of limiting sugar consumption and the Wellness Home products that help us accomplish that goal. Heather and I try to include as much whole foods, while eliminating processed foods in our Wellness Home. Most of our fresh fruits and veggies come from our local farmers market and we do enjoy our home-grown tomatoes, peppers, cucumbers, green beans and indoor herb garden. Whole food nutrition is the basis of our Nikken Active Wellness product line and much of our nutritional support in our Wellness Home is provided by Nikken. Nikken Wellness Organic-Based Nutrition is designed to bring the daily diet closer to nature. Each ingredient is carefully selected and where possible the organic content is maximized. One way that we help ourselves and our family to make healthier food choices is by incorporating the Nikken Active Wellness nutritional products into our everyday lives. Heather is very creative and has been using many of our Nikken nutritional products in recipes for healthier choices. Essential nutrients are compounds that the body can’t make or can’t make in enough quantity. According to the World Health Organization, these nutrients must come from food, and they’re vital for disease prevention, growth, and good health. We have all been taught that we all need daily servings of protein, vegetables and fruits to supply the vital nutritional components. The three staple nutritional products that we rely on daily to accomplish this is what we call our Core Nutritional Pack. These three products ensure that we are getting the three essential components of healthy nutrition. We all start our day with this organic and delicious protein shake. It really starts the day off right, with energy and alertness. Many people have substituted KVB for coffee in the morning to get going with a healthier choice. Kenzen Vital Balance® contains organic moringa and naturally sweet monk fruit in addition to organic pea protein and organic vegetables. It is designed to help burn fat and boost metabolism as well as promote healthy brain function and the elimination of toxins in the body. With pre- and probiotics to assist in digestive and immune system activity, the Kenzen Vital Balance formula is food for action and food for thought and is suitable for people of all ages. Made with organic barley grass and our Proprietary Blend of organic acacia and organic pearl barley seed extract powder. It is Kosher and vegan certified, USDA Organic, certified by QAI and Gluten-free. 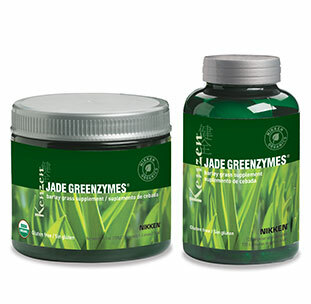 We have two servings of Jade Greenzymes daily. This product also comes in a capsule form, but I personally love the fresh green taste in a glass of Nikken PiMag Water. Super Ciaga is an organic mixed superfruit juice concentrate made exclusively with organic fruit content. This advanced formula is made with a select group of superfruits chosen for their nutrient and antioxidant characteristics. Highly concentrated, it has an exceptional ORAC value. Certified-organic, Super Ciaga supports individuals who want to feel more energized as well as those who need assistance with poor eating habits. A great replacement for sodas, simply mix an ounce of Super Ciaga to a glass of PiMag® water or seltzer for a naturally sweet and healthy beverage! One of our favorite beverages. We would add to the list drinking plenty of water, dehydration is a major problem and a focal point of Self Care. Water is not just a beverage choice, it is our most essential nutrient. Drink half your body weight in ounces of water daily, get your protein, vegetable and fruit servings in a convenient, effective and cost-efficient way with the Wellness Home Nutrition Pack and Be Healthy by Choice. From now through March 31,2019, take advantage of our special on chocolate Kenzen Vital Balance® at 33% discount—Get 3 containers for the price of 2! Chocolate KVB is formulated and manufactured in the USA.